Q John Tennyson asks: "Did Sir Alex Ferguson ever manage Scotland?" A Indeed he did. While he was Aberdeen manager Fergie was also assistant to Scotland boss Jock Stein. When Stein suddenly collapsed and died during a World Cup qualifier in Cardiff in September 1985, Ferguson took over on a 'caretaker' basis. He took Scotland to a play-off victory over Australia and on to the World Cup Finals in Mexico. He remained in charge at Pittodrie during this time and led Aberdeen to victory in both domestic Cups. He stood down from the Scotland post after the World Cup and Andy Roxburgh took over on a full-time basis. Q Maurice Rippin inquires about an old team-mate "I am seeking information regarding Jimmy Stenhouse who I played with at the end of his football career. I understand he was a Scottish International. Is there any possibility you have any stats about his club and International matches?" 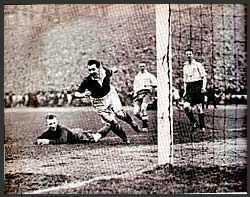 A Jimmy Stenhouse was an inside-right who played in a wartime international v England which Scotland lost 6-2 at Hampden Park on Feb 19th 1944. He also played in every match for the St Mirren team that won the Summer Cup by beating Rangers 1-0 at Hampden in July 1943. Jimmy scored once in the 6-3 defeat of Dumbarton in a second round first leg tie and also in the 3-3 semi-final draw with Morton at Ibrox. After the war he made 25 League appearances for the Buddies, scoring twice, between 1946-48. He was transferred to Aberdeen during the 1947-48 season where he made a further 31 League appearances between then and 1951. Jimmy left Pittodrie in 1951 for Kettering Town and eventually ended up at Stamford Town where he skippered the team, including Maurice, to victory over Stevenage in the Stamford St John Ambulance Charity Invitation Cup Final in 1957. Q 'Totnes' wants to know "Who won the 1963 Scottish Cup Final, what was the score and who scored?" A Because of the severe winter the Final was played in May for the first time and the match between Rangers and Celtic ended 1-1 with Ralph Brand for Rangers and Bobby Murdoch of Celtic getting the goals. Rangers won the replay 3-0 with two goals from Brand and one from Davie Wilson. This was the first Old Firm final since 1928 and the two games were seen by an incredible total of 249,416 spectators. Q From W Griffith: "Did Joe Tinney of Partick Thistle ever get a cap for Scotland?" A The only player with that surname I can find playing for Thistle is full-back HUGH Tinney who was at Firhill from 1963-67 before being transferred to Bury. 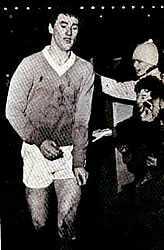 He played twice for Scotland Under-23's in 1966-67 but never made a full international appearance.